Disclaimer: I do not own the characters, they are the property of J.K Rowling. I am simply borrowing them for my amusement and non-profit entertainment. Summary: The twins had always known that they were different from other children, even those among their own family. It wasn't until they were older that the twins found out just how different they truly were. Promoting for the Mini Fest 2017 on weasleyjumpers starts in just four days! 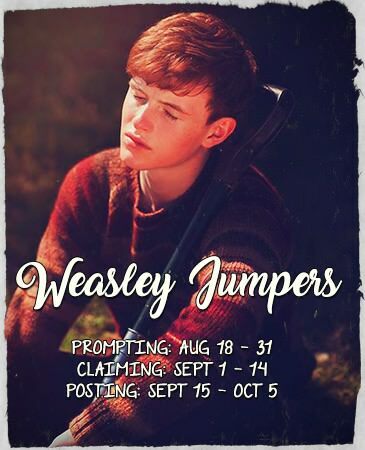 I'd love to see some Hermione/Weasley prompts! Author's Notes: Muggle AU with a bit of supernatural thrown in there. Author's Note: For those of you who are reading this on Books and Freckles livejournal, please look over the last couple chapters, I have combined the shorter ones into longer chapters so the last chapter, which I posted awhile back actually contains new material. Since this chapter ended up being extra long I figured the previous ones should be also. I've got a few more chapters ready and will be posting them throughout the day. Hopefully everyone will let me know what they think of the story so far!